The Atlantis Bookshop is celebrating Crowleymass on Saturday 1st December from noon to 6pm. Every year Bali and Geraldine of the Atlantis Bookshop in London invites people to join them to commemorate the death of one of the shop's most famous customers, by celebrating the Greater Feast of the Prophet of the New Aeon, Aleister Crowley. Crowleymass this Saturday starts at noon. Mince pies and mulled wine will be available all day and the first 39 customers that utter the magic phrase: “The Beast is Dead. Long live The Beast” will claim a present. There’s no need to book in advance – just go along and mark the start of the Festive Season. 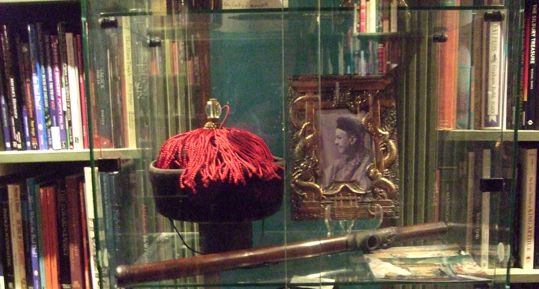 The picture at the top shows Aleister Crowley's hat and pipe on display at last year's Crowleymass.